Glasgow is known for many a thing from its dynamic, bustling nightlife to its luscious array of green spaces to the world-renowned warm hospitality offered by its citizens; however what also sets it apart is its exquisite architecture. Barcelona, you can keep your Gaudi as in Glasgow we have our own architectural master known as Charles Rennie Mackintosh. A Scottish-born artist, designer and architect who was an integral influence in the UK Art Nouveau scene, Charles Rennie Mackintosh is remembered as Glasgow’s most famous son and when you see firsthand his architectural masterpieces, there is no doubt as to why his work is much revered and an iconic part of the Glasgow arts scene. The fact that there is a Mackintosh trail is just testament to the mark that Charles Rennie Mackintosh left on his native city. While Charles Rennie Mackintosh is now internationally renowned around the world as the father of “Glasgow Style”, Glasgow itself did not realise or recognize his talent until after his death in 1928 meaning that although he worked almost exclusively in Glasgow for 20 years, he died predominantly unknown. Attending the Glasgow School of Art, Charles Rennie Mackintosh became part of a group of artists which became globally renowned as “The Four”. Collaborating on designs for things like furniture and illustrations, their imaginative art graphics were known to be some of the most innovative of the time and as a result of their imagination, could be considered relatively unusual and much different from anything else being designed at the time – it was in a world of its own. Although his work did not gain much recognition in his native city to the extent where he departed to live in London, his work was held in much higher regard internationally where countries like Germany and Austria really embraced and admired his pioneering style and he even exhibited in cities like Moscow and Berlin. Apart from his inventive and original style, what really set Charles Rennie Mackintosh apart was his strong belief that the architect was not just responsible for the exterior of the building, but also for every detail of the interior – rooms were to be a work of art themselves. Consequently, like his architectural style, his furnishings were highly differentiated but still with an elegance and intricacy. While making his work iconic posthumous, it was also for this reason that Charles Rennie Mackintosh was not as greatly respected during his life because many private clients did not have the patience to see his projects through from exterior to interior. Daily Record Building: The former residence of the Daily Record paper up until the late 1930s, the Daily Record Building is often forgotten but is a must-see due to Mackintosh’s ability to bring light and colour into the dimly lit narrow alley. The Hill House: Once a domestic residence for the famous Glasgow publisher Walter Blackie, this property is now owned by the NTS. 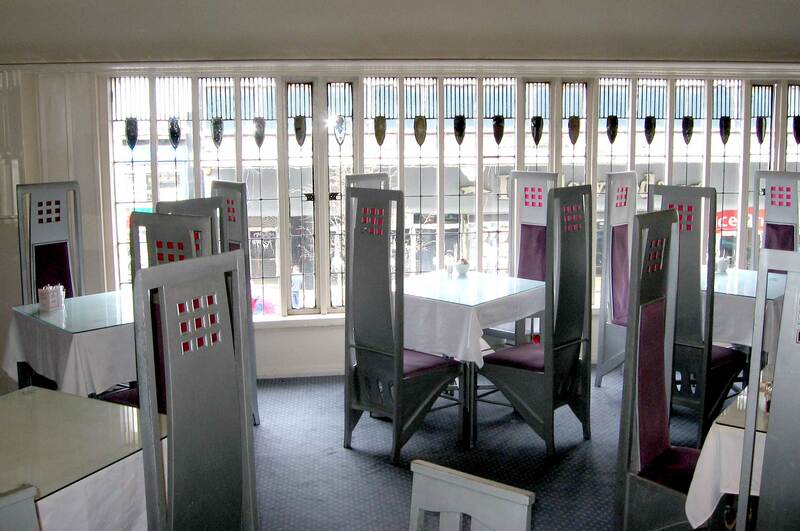 This is an example of some of Mackintosh’s most famous interior designs with the pieces still remaining in considerable good condition despite the passing of time. A particular highlight is the inclusion of Mackintosh’s renowned ladder-back chairs as well as the stunning use of decorative glass. House for an Art Lover: One of Glasgow’s key cultural attractions and a 4 star rated tourism attraction, House for an Art Lover is located just 10 minutes from the city centre. Once an entry for a German competition, Mackintosh’s vision was only fully brought to life in the 1990s and within the attraction you can see the comparison between the original designs and the actual implementation. The Willow Tea Rooms: Some historical sites cease being used for their purposes in the name of conservation, however The Willow Team Rooms is one of the exceptions to this as to this today it is still serving the purpose for which it was designed – a site in which to enjoy the finest Afternoon Tea. Containing the original doors, windows and mirrors, this is a fan favourite location for local, national and international tourists alike. The Lighthouse: One of his public commissions, The Lighthouse (which was previously the Glasgow Herald building but is now the Scotland’s Centre for Design and Architecture) is a must-see on the Mackintosh trail not least because it contains a permanent exhibition to the man himself but also because tours of the building can be taken so you can obtain a real insider view of Mackintosh’s work. Queen’s Cross Church: As the only church designed by Charles Rennie Mackintosh, this is definitely a stop for his fans particularly as it is relatively unknown and is therefore a real hidden gem that is located just minutes from the city centre. Now home to the Charles Rennie Mackintosh Society, there is a host of exhibitions and events held throughout the year and so there is always a reason to visit, if not just to admire the beautiful stained glass. Mackintosh House: He designed some of Glasgow’s most exquisite buildings, but what about the place he called home? A particular highlight of the Mackintosh trail has to be a visit to the splendid recreation of Mackintosh’s home within The Hunterian which contains interiors designed by Mackintosh itself. The recreation considered even the smallest details such as the use of natural light and is a marvellous insight into how Glasgow’s famous son lived. The Glasgow School of Art: Of course, there is no denying that the star attraction of the trail has be Mackintosh’s master work which was The Glasgow School of Art – his greatest architectural work. Although partly tragically damaged in a fire in 2014, much remains to be explored with award-winning tours being taken that reflect Mackintosh’s journey from student to architecture extraordinaire as well as an permanent visitor centre. Also including the brand new Mackintosh Furniture Gallery, there is no better place to really understand Mackintosh’s inspiration and life. While a Mackintosh style tour of Glasgow is always an attractive option regardless of the time of year, there is no month better than October because as well as being the month known for giving us an extra hour in bed and many a scare on the 31st, it is also the month of the Mackintosh Festival! The Mackintosh Festival is a month-long celebration of the life and works of Charles Rennie Mackintosh and the celebrations encompass exhibitions, events and tours meaning there is something for everyone whether you are a Mackintosh connoisseur or just looking for a family day trip. For full details of all the excitement taking place see here: http://www.glasgowmackintosh.com/festival. Therefore, with the October holidays still in full swing, there could not be a better time to visit our apartments in Glasgow this month!